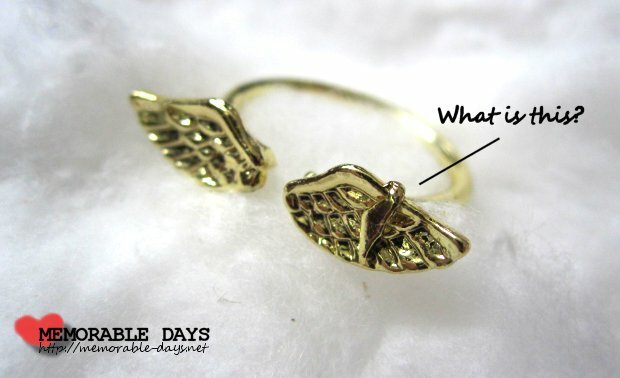 Golden Angel Wing Ring From Ebay.com | Memorable Days : Beauty Blog - Korean Beauty, European, American Product Reviews. 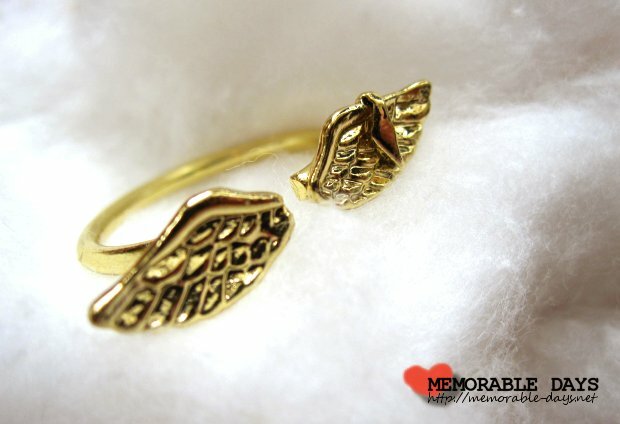 I recently bought a golden angel wing ring on Ebay.com. It looks so cute on the picture ^^. I bought it from Ebay seller: lotusmind369 for $1.49 including free shipping. They shipped within a week! (See picture on the left) This is how it looks like on Ebay. There are two colors: gold and silver. I always prefer gold than silver, it somehow suits me better xD. 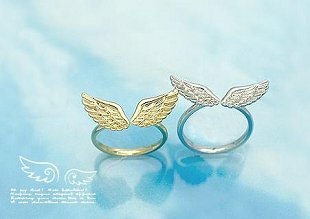 The ring from wing to wing is 2.1 cm. On Ebay it's said that it's adjustable but it's NOT! Material: Alloy. Inside diameter is 16.0 mm. which is size 5,24 in the US/Canada. It's quite large for me, so I'm wearing it on my index finger. The ring that I received does looks similar to the picture above, but some weird thing was added on the ring. It's probably a manufacturing fault? Unfortunately, it can't be removed T___T"...so, I messaged the seller and that person replied me on the same day (FAST REPLY!) with the message that she was willing to send me a refund. What an awesome service it is. I haven't met such a great seller at Ebay before, really xD! This is how it looks like from the front and back. UPDATE: The ring does rust of course, but you must try to keep it away from water or sweat, otherwise it will rust extremely fast. Aah wat leuk :D wel stom van het foutje maar wat een geweldige verkoper zeg. Aww such a waste. I used to buy rings from Ebay but I realised they rust really, really fast. Well perhaps you could paste a giant bling/diamante on it to cover the flaw! ^^ it could just work. ah wel zonde van dat dingetje er op, opzich is ie erg leuk. That's great that the person was willing to give you a refund! It's a shame since the ring that they were supposed to give you is super cute! Heb je al geprobeerd om een dun laagje transparante nagellak over je ring aan te brengen tegen het roesten? Je ziet er niks van en het werkt best goed.